A number of years ago, when I was doing the Dangerous Talk radio show on WCUR 91.7 FM in West Chester PA, I had a fundamentalist Christian preacher on. This particular preacher, who went by the name “Saint Stephen,” would travel to different Universities and tell everyone that they were not moral and that they going to Hell. There is nothing unusual there except for the fact that he would even preach this message to the other fundamentalists Christians. He came to the studio with his wife and two young sons, although he was the only one on the air. At one point in our conversation, he told me that there can be no morality without God. Saint Stephen, like so many other fundamentalist Christians, proudly pronounced that morality was grounded by God and that he followed God’s commands without question. This prompted me to ask him the ultimate “gotcha” question. Right outside the on-air studio in the next room, separated only by a glass window, was his wife watching over their young children as one sat in his stroller and the other ran around the hallway. “If God ordered you to kill one of your sons, would you do it without question?” I asked. All of a sudden, his wife peered into the window and staring at him waiting for him to answer and his older son froze in his tracks. A few seconds seemed like hours. Then he answered that God wouldn’t give that order. It would be contradictory to his nature or something such nonsense. I remember he looked like he had dodged a bullet with that answer, but I didn’t let him off the hook that easily. I reminded him about Genesis 22 in which God ordered Abraham to sacrifice his son Isaac. He smiled and laughed and said that Abraham didn’t actually kill Isaac because the angel stopped him. It was just a test. He looked at his wife and then at his son, now also up against the glass window of the studio, and then told me honestly that he didn’t know and that he would have to get back to me on that. Well, since then, some stuff happened and he never did get back to me… but I digress. My point is that this seemed to be a huge moral dilemma for him and it really shouldn’t have been. Not long ago, I asked this same question to my Christian friend Greg and he kept refusing to answer. But I don’t really see why it is such a tough question for him either. Of course he should kill his kid. Am I right? It’s a no brainer. Remember, God’s whim is the very foundation of morality. Morality is grounded in God’s commands and so if God has commanded someone to kill their child, then obviously that must be the moral thing to do. Sacrificing a child to God is the only moral choice. God said so. Beside, God could always stop someone at the last minute or has my friend Greg pointed out, God could even bring his child back to life like he did Job’s kids… oh wait, bad example… God just allowed Job’s wife to have new kids. Because we all know that kids can just be replaced with new kids, right? LOL. Still, it isn’t like the child will be torture for all eternity or anything, I’m sure both Saint Stephen and Greg have raised good Christian children who have been indoctrinated and believe with 100% certainty that Jesus is their Lord and savior. This is good news because after my Christian friends sacrifice their respective children, their children get to go to Heaven to live in bliss for all eternity. My Christian friends will see their respective children again real soon (relatively speaking). On the other hand, if I am correct and the true source of morality isn’t God, but is instead human empathy and compassion, then it would be morally wrong to kill a child as a sacrifice to a deity or for pretty much any other reason. It doesn’t matter if God commands it or not, it would be morally wrong. Now here is the rub. The very fact that Christians hesitate on this question is evidence that morality really is about human empathy and compassion even if the Christian ends up making the wrong moral choice (as sadly a few might). We have a moral intuition based on our human empathy and compassion that killing children or pretty much anyone else for that matter is morally wrong in most cases. When Christians debate this issue in their mind, they have to make a choice against what we know to be moral. They have to weigh their love of their deity against what they know to be moral. In other words, even if they choose their deity, they have conceded that it was a difficult choice worthy of inner debate and conflict. Why? Christians don’t want to obey God if God commands them to kill their kid. They still might obey God and that would be horrific, but part of them knows that it would be horrific and that is my point. If God commands it and he is the true source of morality, the thought of obeying God’s command no matter what that command might be, would be a no-brainer. The cognitive dissidence around an Abraham’s choice, is proves that we have a sense of morality apart from God’s commands. Writer’s Note: Portions of this article are from previously published material from this writer. One of those all important ten commandments was an order from god NOT to kill? But, god also ordered the killing of an entire tribe of people – man, woman and child and even the livestock – except for the maidens who were to be used as desired. To follow which order is the moral path? What Alethea said was exactly the point where I finally realized the nonsense of all this: By first giving the commandment “Thou shalt not kill” (I’m ready to give room for this to be interpreted as “you must not murder”, but to kill a whole tribe, kids and babies included, is still murder) and then ordering his followers to kill every living being in Jericho, God ordered them to commit a deadly sin, something that “good”/moral humans would not do unless ordered to. Also note that there would have been an easy way out for God by expressing the commandment as “thou shalt not kill your neighbor” as it is the case with several other commandments – it’s fine to covet some else’s wife or house or whatever he has as long as it’s not your neighbor – these other commandments are “limited” to neighbors. But this one isn’t. You must not murder. Ever. Not anybody, friend or foe, neighbor or alien. But then, only a short time later, they appear at Jericho. While I identify as Christian, you have a pretty solid point in regards to the child sacrifice argument. The sacrifice was more so about Abraham’s trust factor. He came to know God for a while, but had never been tested to this extent. God told Abraham that a nation would be born through his son Isaac. God made Abraham a promise about Isaac. God also said that He’d never break a covenant (Psalm 89:34). Abraham’s trust in God’s word was so great that he believed even if Isaac were to die, God would resurrect him, to keep His word (Hebrews 11:17-19). 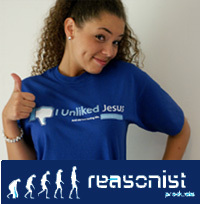 I would I’d love to discuss more of your beliefs and hear your opinions about other areas, if you’d like. Wonderful blog by the way. Also, unlike many other atheists, I applaud your effort of actually trying to read the Bible; even if just to refute its words against it. With all due respect, I don’t think you know many atheists. The fact is that most atheists know the Bible better than most Christians. There have actually been studies on this. Also, I didn’t read the Bible in order to refute it. I was once a believer. The fact is that the Bible refutes itself. It really is a ridiculous series of books. You’re correct in that I don’t know many atheists, and my intention wasn’t to categorize all of them into one type; my apologies. If you don’t mind me asking, when was the turning point of your Christian faith? What caused it? Again, that’s Christian arrogance. I never said I was a Christian. I said I was a believer. I grew up Jewish. Once again, my apologies; but you surely you still believe in a higher power, no? Do you really believe that through all the complexities in life, from childbirth to the amazing intricacies of the human brain, that humans are the smartest beings in the universe, yet can’t control the weather, time, or space? Can you really believe that we are our own gods yet cannot create life (aside from the blessing of childbirth) or planets or universes and cannot escape physical death. There are countless things that humans have yet to discover. The beauty of nature from the animals, mountains, and oceans could not have been created by man. The way the moon is in sync with the seas is extraordinary. If the sun were any closer to the earth, then we’d burn; any further and we’d freeze. It’s the perfect distance, that we need. The laws of gravity work are so in order and they never fail us. The fundamental forces that are gravity don’t “turn off”. The laws of nature work all too perfectly to be a result of an accidental explosion. Nothing so perfect can be the result of an accident. Everything that is designed has a designer. Also if you’re interested in unexplainable facts read up on Annabel Beam and research other people being healed of incurable diseases (ie. cancer, pseudo-obstruction motility disorder) just as in the New Testament. The choice is yours to accept or deny these findings, and that’s fine with me. Have a blessed day sir. Why is it that Christians can’t stay on topic? This post is about morality and for the record, you haven’t really addressed that issue. I have a ton of blog posts dealing with the multiple topics you casually through at me all at once. I suggest you take some time and look through the category section in the sidebar and find out what I have already said about all that crap. Also, Google and Wikipedia are your friends. Use them! I’ve already addressed your argument of this post in my first comment, which you didn’t respond to. I find it I nteresting how 8% of atheists in America believe in a high power, kind of contradictory. Also, why haven’t you done a post on signs of the end times which are occurring now? You gave a rationalization, but didn’t address the actual issues raised in the post. Yes, you’ve talked about the end times in general, but not specifically the signs already occurring, such as: famines(Ukraine, Yemen), droughts(Cape Town), rumors of war(North Korea, Iran, Russia), various major earthquakes, deadly diseases (spread mostly through animals), along with Israel being surrounded by many enemies and soon being overtaken. Yeah, you really can’t stay on topic. But okay, whatever. Those “signs” are always happening!!!! There has never been a time when there have not been famines, earthquakes, wars, diseases, etc. I already wrote an article talking about Jesus’s end times prediction. If you want to talk about sometime off topic, either discuss it in a blog post where it would be on topic, or message me privately. But his post is about morality and you have not been able to address that issue. The blog post asks very specifically, if God told you to murder your child (or any child if you don’t have one), would you do it? It is a very simple yes or no. If morality comes from God, then your answer should unquestionably be yes. You shouldn’t even have to think about it. Mr. Staks, you have only written that you should not be rant and the writing must be as brief as possible and the point. 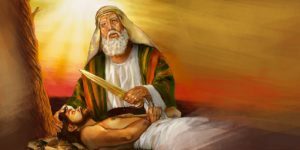 Only one point God asked Abraham to kill Issac and that you raised this point before a priest……………The matter was not settled at all between you two and you are going on and on with this……… What is this? There might be a bit of a language barrier here, because I don’t really understand your comment. Can you clarify please? Thanks.